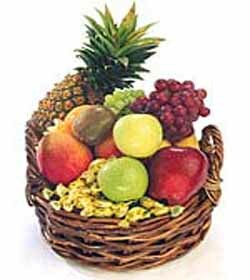 Description: Our classic fruit baskets are filled to the brim with an assortment of the freshest seasonal fruits and hard candies. With fruit such as crisp apples, luscious oranges, and ripe pineapple, our baskets are a great treat for anyone on your list. They also make great gifts for the gang to share! Exact basket and fruit selection may vary by season and delivery location. (10 items).